Carrying on along the National Route 7 highway (Hangeul: 국도 제7호선), we crossed over Yangyang Grand Bridge (Hangeul: 양양대교), on the southern side of Yangyang-eup (Hangeul: 양양읍; Hanja: 襄陽邑). In the photo above you can see Yangyang on the northern side of the river. The photo above was taken a bit further on along the bridge, you can see that Yangyang is considerably more developed than the villages we had been passing through before. 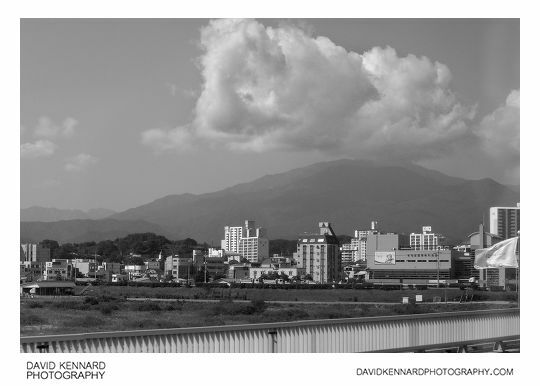 You can also see parts of the Taebaek Mountain Range (Hangeul: 태백산맥; Hanja: 太白山脈) in the background in many of these photos. The mountain range runs along the east of Korea, and Seoraksan Park (my final destination) is part of the Taebaek range. Unfortunately the bus' route didn't take us in front of the above statue, but I guess a photo of its back is better than no photo at all. 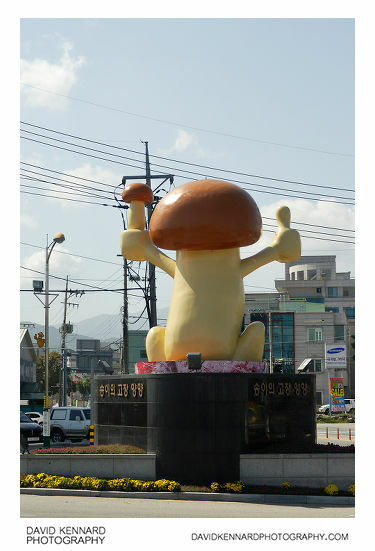 The statue is of a giant mushroom, which is Yangyang's mascot. Yangyang is famous for its pine mushrooms (Hangeul: 송이; Hanja: 松栮; Scientific name: Tricholoma matsutake), and even has a mushroom festival every year. 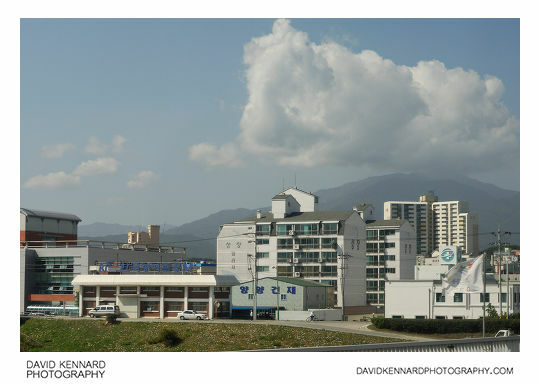 Yangyang is also famous for its seafood, particularly salmon, and of course it has the seaside and mountains as well. Out of the main part of Yangyang, we passed a stone mason's (above), called Hanyang Stone (Hangeul: 한양석재). 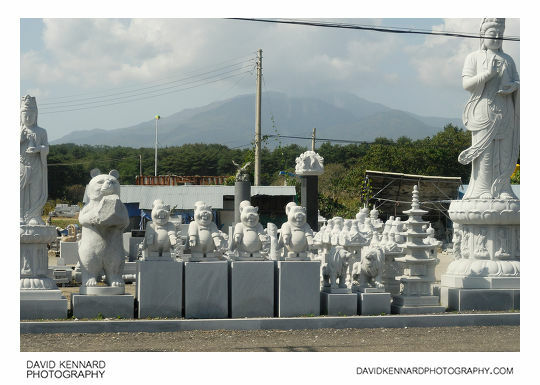 In this photo you can see a Bodhisattva statue, what looks to be a Korean Moon bear with Mickey-mouse style ears holding a rock, 4 happy chipmunk statues, 2 stone lions, a stone seven story pavilion, and a Bodhisattva who appears to be sniffing one of the many wires that permeate Korea's infrastructure. About a second later (above), and the Bodhisattva is still sniffing the wire. 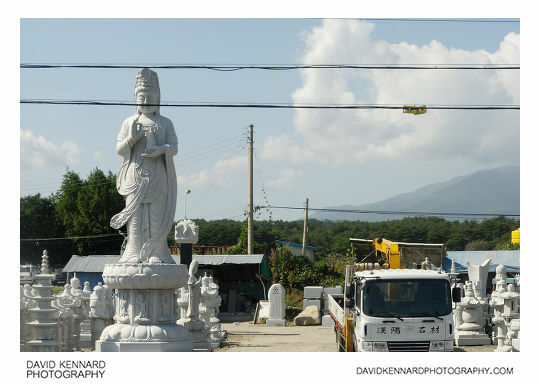 In this photo you can see one of the trucks they use for delivering the stone sculptures as well.